National Park is located in the southernmost tip in Taiwan. Swan Lake Villa Resort is the only private villa resort with lakes and ecological ponds, surrounded by gardens. An interior that calmed down in a resort to a making that attached importance to indispensable privacy. There are a lot of coastlines up to Kending. It is the resort feeling from before arrival to Kenting. Taiwan southernmost resort area Kenting. 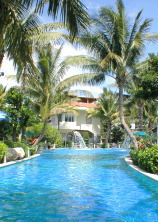 Swan Lake Hotel,it is the only formal Villa Resort Hotel in Kenting. Space that was surrounded in nature. Enjoy a transfiguration of a scene by morning noon evening and time. SPA that was surrounded to a coconut palm and flowers. There are Hydrocarbonate Solt Spring Stream SPA and Hydrocarbonate Solt Cold Spling Swimming Pool etc. Breakfast service is Chinese food and Western cooking by local cooking of Kenting mainly.